She is the Founder & President of the Jamie Lynn Sullivan Memorial Foundation and has her own makeup business. When Andrea is not in the office, she loves spending time with her husband and four teenagers. She has a passion for baking, photography and watching her boys play hockey. I switched to Long Wharf Dental because of Geraldine. 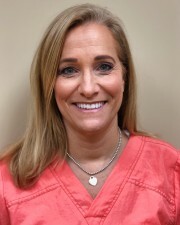 She has been my dental hygienist for about 25 years. She makes you feel comfortable. My family are also patients of hers. Great dentists, wonderful staff and I always recommend my family and friends to choose Long Wharf Dental for all their dental needs! Great customer service. Friendly staff. Fast and quick service. First visit, got everything done, even squeezed me in with the dentist right after my appointment! Great service and so pleasant! I was in and out quickly and didn’t feel anything. I drive a long distance to see Dr. Lerman. He’s the best! Also have been coming here for over 25 years. I would definitely recommend anybody needing Dental Care to come here. It is ALWAYS a 5 star experience no matter what type of dental work you are having done. Always happy to see Lorena (for MANY MANY years! She’s great.